Published: March 22, 2019 at 02:05 p.m. Updated: March 22, 2019 at 06:06 p.m.
Mike Tomlin and Mickey Loomis were among the scouts and coaches in attendance to see LSU football's best, including Devin White, Andraez "Greedy" Williams, and Ed Paris. With nearly a month away until the 2019 NFL draft, take a look at some of the best moments of the 2019 LSU Pro Day. 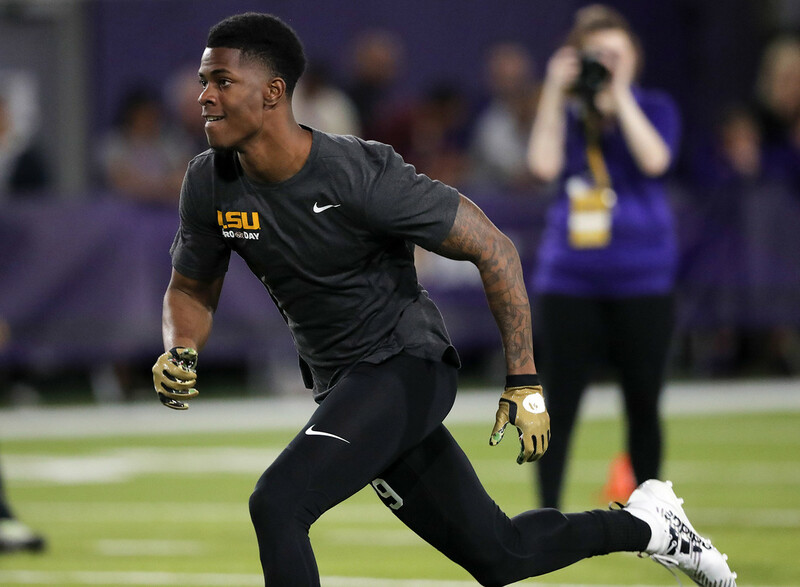 LSU cornerback Andraez "Greedy" Williams works out during their NFL Pro Timing Day at their NCAA football training facility in Baton Rouge, La., Friday, March 22, 2019. LSU linebacker Devin White works out during their NFL Pro Timing Day at their NCAA football training facility in Baton Rouge, La., Friday, March 22, 2019. Pittsburgh Steelers head coach Mike Tomlin watches during LSU NFL Pro Timing Day at their NCAA football training facility in Baton Rouge, La., Friday, March 22, 2019. LSU cornerback Andraez "Greedy" Williams holds his daughter, Khloe, as defensive back Ed Paris touches her, between drills during their NFL Pro Timing Day at their NCAA football training facility in Baton Rouge, La., Friday, March 22, 2019. LSU running back Nick Brosette works out during their NFL Pro Timing Day at their NCAA football training facility in Baton Rouge, La., Friday, March 22, 2019. New Orleans Saints general manager Mickey Loomis, right, and vice president of football administration Khai Harly, watch during LSU NFL Pro Timing Day at their NCAA football training facility in Baton Rouge, La., Friday, March 22, 2019. LSU tight end Foster Moreau works out during their NFL Pro Timing Day at their NCAA football training facility in Baton Rouge, La., Friday, March 22, 2019. LSU tight end Jacory Washington works out during their NFL Pro Timing Day at their NCAA football training facility in Baton Rouge, La., Friday, March 22, 2019. LSU head coach Ed Orgeron, center, watches during their NFL Pro Timing Day at their NCAA football training facility in Baton Rouge, La., Friday, March 22, 2019. LSU fullback David Ducre works out during their NFL Pro Timing Day at their NCAA football training facility in Baton Rouge, La., Friday, March 22, 2019. LSU defensive back Ed Paris works out during their NFL Pro Timing Day at their NCAA football training facility in Baton Rouge, La., Friday, March 22, 2019. Former LSU and NFL quarterback Matt Flynn, throws during LSU NFL Pro Timing Day at their NCAA football training facility in Baton Rouge, La., Friday, March 22, 2019.